It’s been some years since Tom Fleming and I have indulged in seven-day mad dashes across the Balkans, speaking, lecturing and giving interviews, meeting interesting people over good food and drink. Last week’s tour, which took us to Belgrade and Banja Luka, had the tempo and feel of the old times, but it was on balance a melancholy affair. After two decades of trials and tribulations, Serbia is on what appears to be an irreversible downward spiral. The dilemma facing the country was summed up by Dr. Fleming [start watching at 0:05:15] at a symposium at Belgrade’s Media Center on December 5. How does a small and weak nation respond to the challenge of a hostile and mighty foreign power which seeks to subjugate it? What is the right balance between defiance and subservience? That dilemma will not be resolved by a party program or by intellectuals writing manifestos. The only way to meet the challenge is to maintain faith and identity… and to procreate. In other words, the solution to Serbia’s woes is not structurally different from the solution to the malaise of some bigger and more important countries on both sides of the Atlantic which are also experiencing moral and cultural decrepitude and demographic decline. This was inevitably the topic of conversation at a dinner we shared that evening with Dragan Acovic, our polyglot friend whose professional and social pursuits make him one of the best informed people in Belgrade. His assessment was gloomy: the West may be declining, but Serbia’s decline is far swifter. The country may be further fragmented (Vojvodina, Sanjak) well before America finally gives up her imperial pretensions and the European Union disintegrates under the weight of its insoluble contradictions. The cumulative effect of relentless Western hostility over the past two decades, currently on display in northern Kosovo, has taken its toll. Belgrade’s political scene is dominated by a corrupt “pro-European” coalition led by the Democratic Party (DS) of Boris Tadic. While it claims to be more patriotic, the leading opposition party—the Serbian National Party (SNS) of Tomislav Nikolic—is almost equally enthusiastic about the alleged advantages of joining the EU, and just as ambivalent when it comes to maintaining and defending Serbia’s claim to Kosovo. The Socialists (SPS), opportunistic as ever, are likely to remain in the ruling coalition no matter who forms the government after the next election. 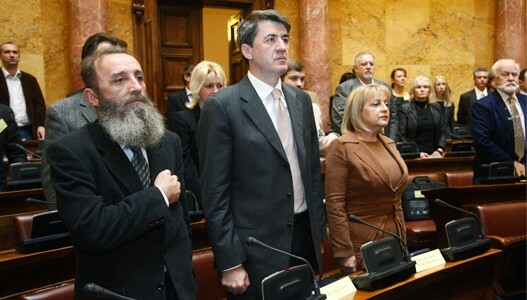 The Democratic Party of Serbia (DSS) of my old friend Vojislav Koštunica and Šešelj’s Radicals (SRS) may get a third of the vote between them but are more or less certain to remain in the opposition. On Tuesday, December 6, we attended an international conference on World War I in the Balkans which was jointly organized by the Institute for Contemporary History in Belgrade and the Russian World Institute in Moscow. The opening, at the ornate Senate Room of the National Assembly, was a major affair attended by government ministers and by the Russian Ambassador, Aleksandr Konuzin, who was to host a large reception at the Embassy in the evening. The following day, however, it transpired the conference itself was practically ignored by the Belgrade media. According to one of the organizers, editors received a discrete signal from on high that appearing too chummy with the Russians was not a good idea on the eve of the much anticipated EU decision on Serbia’s application for candidate status. In the event Brussels said “no,” as expected, and Mr. Tadic pretended to be surprised. The rest of the country remained indifferent. Most Serbs have finally realized that the benefits of EU membership are dubious at best, and that the never-ending escalation of demands by the European Commission won’t stop short of Belgrade’s formal recognition of Kosovo’s independence. In any event, candidate status is meaningless without a timetable for accession—and that is something Serbia and the rest of the Western Balkans (save Croatia) will not get for many years to come. Gripped by financial woes and internal divisions the EU is in a state of chronic crisis. Germany and France in particular are not interested in admitting a cluster of poor and potentially troublesome countries. In their view letting Greece in was a mistake, let alone Bulgaria and Rumania. On Wednesday morning, having presented our papers at the Great War Conference, Dr. Fleming and I headed to Studio B, Belgrade’s most popular local TV station, for a live interview. The presenter was pretty yet intelligent, the conversation fast flowing, and we were in decent form. It was good to be back at the same studio where, 20 years ago, I had my first live appearance before a TV camera. It would be trite to say “it seems like yesterday,” but it does. Scary. The drive from Belgrade to Banja Luka (220 miles) took us for the most part across Croatia’s flat and boring Slavonia region. Border formalities are kept to a minimum these days, enabling us to make the journey in just over three hours. Seeing the speedometer hover around 125mph (200km) Dr. Fleming calmly asked me not to wake him up if we are about to die as he would prefer not to be stressed out at that moment; whereupon he promptly dozed off. Banja Luka, the capital of the Republika Srpska—the Serb half of Bosnia-Herzegovina—has doubled its population to over 300,000 since the beginning of the Bosnian war. It seems cleaner and more prosperous than Belgrade; the people look better dressed and happier. The students in my class at the School of Politics are attentive, smart, and ask interesting questions. They are unburdened by the fetters of political correctitude (one young man implied that I was way too soft on Islam!) and comfortably rooted in their identity. The discussion following Dr. Fleming’s lecture on the U.S. foreign policy last Thursday indicated that they are also well informed on global affairs. They are most unlikely to accept eventual “Bosnification” and the reduction of the Republika Srpska to an empty shell, which is still the preferred scenario in Washington. The dinner with Professors Tanaskovic and Nagradic on Thursday evening gave us an opportunity to pick up some local political gossip and to exchange views on the future of Bosnia. We all agreed that the “international community” (i.e. the United States and its Euro-satellites) has neither the political will nor the resources to impose a centralized, unitary state on the Serbs. Prof. Tanaskovic, a leading European expert on Islam, also regaled us with the stories of his Western colleagues expressing surprise at the triumph of hard-core Islamist parties in Egypt and Tunisia. He noted the tendency of Western liberals to project their own image into the world of Ikwanis and Jihadis, immediately looking for some mystical divide between “hard-liners” and “moderates” where in reality a numbing ideological uniformity prevails. Bishop Jovan now has the difficult task of providing spiritual guidance and support to the dwindling Serb population of Metohija (aka Western Kosovo, in the parlance of the internationals), establishing rapport with the upper brass of local KFOR contingents (mainly Italians), and defending the interests of his Church vis-à-vis the Albanian authorities. Judging by our evening together he approaches this task with good cheer rooted in strong faith. Becoming a Prince of the Church has not gone to his head. On Saturday morning, just before departing for Belgrade, we were received by the Bishop of Banja Luka, Jefrem, at his splendidly renovated palace. His Grace expressed regret that the rhetoric from Washington is still encouraging the Muslim (“Bosniak”) proponents of Bosnia’s centralization to hope for a revision of Dayton that would effectively liquidate the Republika Srpska. This is the single most disruptive factor preventing an agreement among Bosnia’s three constituent peoples on a viable long-term model of statehood, the Bishop said. He also fully agreed with the view that maintaining faith and culture is the key to survival in the uncertain times ahead. The final show for Dr. Fleming was on Sunday afternoon at the Institute for European Studies, where Miša Ðurkovic, Serbia’s foremost paleo-equivalent, introduced him. I was too tired to join them and a few others for dinner afterwards, but I understand that a jolly good time was had by all until the wee hours. The Serbs have very good reason to feel apprehensive about the future, but that does not mean they will stop enjoying the present.